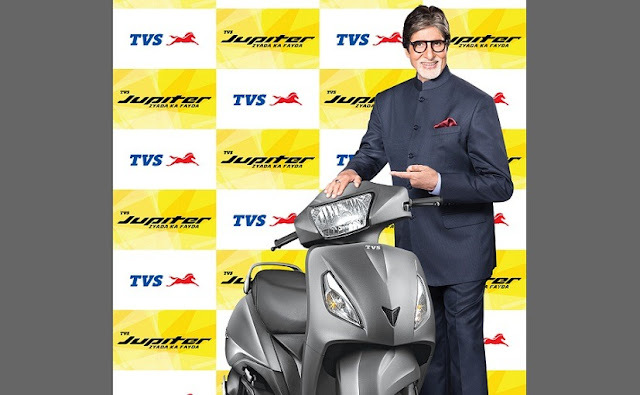 Indian two and Three wheeler manufacturer company TVS approached megastar Amitabh Bachchan as "Brand Philosophy Evangelist" for its popular two wheeler scooter 'Jupiter'. This is the first time when Big B is endorsing an automobile brand in the two-wheeler space, the company said in an statement. See Also : Hrithik Roshan and Amitabh Bachchan roped in for Dhoom 4? "Amitabh Bachchan is held in high esteem in the hearts of India. He embodies the fact that success comes from talent that is nourished with great diligence, character and the spirit of wanting to do 'zyada'," TVS Motor President & CEO K N Radhakrishnan said. The TV advertisement of ' jupiter' featuring Amitabh Bachchan has been made by film director Shoojit Sircar. "It is an honour to associate with TVS Motors, especially, with its flagship Scooter brand the TVS Jupiter. I felt very welcome, and at home here," Bachchan said. Jupiter is most preferred two Wheeler in it's segment. It crossed sales of "half a million unit" milestone in 18 months.